Ficus benjamina var. haematocarpa (Blume ex Decne.) Miq. Ficus haematocarpa Blume ex Decne. Ficus retusa var. nitida (Thunb.) Miq. Urostigma benjaminum var. nudum Miq. Ficus benjamina, commonly known as weeping fig, benjamin fig or Ficus tree, and often sold in stores as just ficus, is a species of flowering plant in the family Moraceae, native to Asia and Australia. It is the official tree of Bangkok. The species is also naturalized in the West Indies and in the States of Florida and Arizona in the United States. 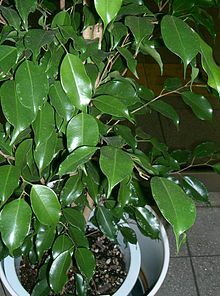 Ficus benjamina is a tree reaching 30 metres (98 ft) tall in natural conditions, with gracefully drooping branchlets and glossy leaves 6–13 cm (2–5 in), oval with an acuminate tip. In its native range, its small fruit are favored by some birds, such as the superb fruit dove, wompoo fruit dove, pink-spotted fruit dove, ornate fruit dove, orange-bellied fruit dove, Torresian imperial pigeon, purple-tailed imperial pigeon (Frith et al. 1976).